Italian-style crime classic set in depression era Chicago with great acting and production - highly recommended. US R1 DVD release. Chicago 1930, the depression is at its peak and prohibition has given rise to bootleggers who are prepared to use extreme violence to achieve their means. Al Capone (Robert De Nero) is the biggest name in the business but goes to extreme lengths to cover his tracks. The film begins as violently as it continues, an uncooperative bar owner has his property blown up by Capone's agents, killing a small girl. Enter Eliot Ness (Kevin Costner) the new head of the Treasury Department, charged with stopping the bootleggers. But his first raid is a failure – someone has tipped off the bootleggers and all the hooch is gone. Taking some hints from experienced Chicago cop Jim Malone (Sean Connery), Ness sets up a dedicated squad known as the Untouchables – just four men: Ness; Malone, an accountant and a sharp-shooting rookie cop (Andy Garcia) – his hope, to avoid the corruption that has spread to every level of the justice system – but the cost is high, to his family and colleagues as they battle to bring Capone to justice and end his reign of terror. Loosely based on the real life exploits of Eliot Ness as told in his own books, and later made into a television series (1959-63); the strong script has plenty of unexpected and shocking turns with good pacing, it should keep you hooked throughout. Despite the praise however, the script is not without flaws. The character of the accountant at times approaches that of comic relief, especially during a shootout at the Canadian border; while Sean Connery's old wise cop is an incredible cliché. Strangely some of the storyline also seems to be missing – in one scene we suddenly see Eliot Ness at his wife's bedside having just given birth to a son, no mention of this is made either before or after. A shootout in a railway station later on contains a very laboured reference to Battleship Potemkin (1925). Although the story is only very loosely based on real life – the Untouchables were a much larger group than the four seen here – this is unlikely to prove a concern to most viewers. The film looks great and takes full advantage of its big budget. Brain De Palma is able to fill his scope widescreen frame with impressive looking 1930 Chicago sets that all look fantastic. The actions scenes are bloody but realistic and the film boasts some very impressive, lengthy PoV steadicam sequences and tracking shots. Ennio Morricone brings a typically strong score to the film, from a pounding opening score, to some solid incidental tracks. The Untouchables has a very strong cast. Kevin Costner, a relative unknown at the time, takes the lead role with a great performance. Sean Connery gives an Oscar winning performance as the experienced but perpetually overlooked cop, and brings a the feel of a man who has his last chance to make a difference. Robert De Niro steals the show as Al Capone, he carries over the look and feel of the lead gangster to perfection and is completely believable. The rest of their cast pull their weight too, bringing a solid feel to the whole film. In all, this film is a very good watch. The all star cast get to work in wonderful sets with a good direction and a script that contains a few holes, but keeps the film moving and entertaining. Cult film fans prepared to watch something more mainstream than usual should certainly enjoy this production - the Morricone soundtrack and violent action scenes hark back to the Italian crime movies of the 1970s while the setting brings to mind the classic 1920s American Gangster pictures. A highly recommended film. Anyone famous in it? Kevin Costner - Often maligned star of Waterworld (1995) and Open Range (2003). Sean Connery - Famous as the first James Bond in Dr. No (1962) also in A Bridge too Far (1977). Robert De Niro - Two time Oscar winner, notable cult films include Brazil (1985) and Frankenstein (1994). Directed by anyone interesting? 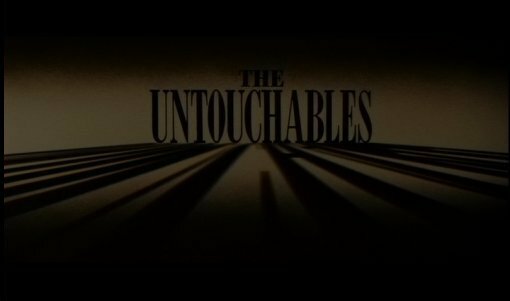 Brian De Palma - talented artist, director of Mission: Impossible (1996), Scarface (1983), Carrie (1976) and apparently now working on an Untouchables prequel. Any violence? Several people get killed, and there are a few violent fight scenes. Blood flows freely but is quite realistic. General interest, all film fans should enjoy. Good soundtrack? Ennio Morricone provides a very strong and varied score that enhances the film. The picture quality is good, some light grain throughout, and some light speckles in some scenes. Always Watchable. Audio Original English Dolby Digital stereo - sounds great, no hiss. Also, Dolby Digital 5.1 EX remix and French Stereo dub. Subtitles Film and Documentary features: English, French and Spanish. These include new and contempory interviews with cast and crew as well as a lot of backstage footage. Contempory piece, similar to modern EPK documentaries. Other regions? UK and Europe R2 collectors editions, identical releases except some have different subtitle and audio tracks. A very strong film: all star cast, great production design and well directed. Let down only by a few script flaws. Good looking print of the film and a nice array of documentary pieces, no audio commentary though. Find our reviews of other films scored by Ennio Morricone.